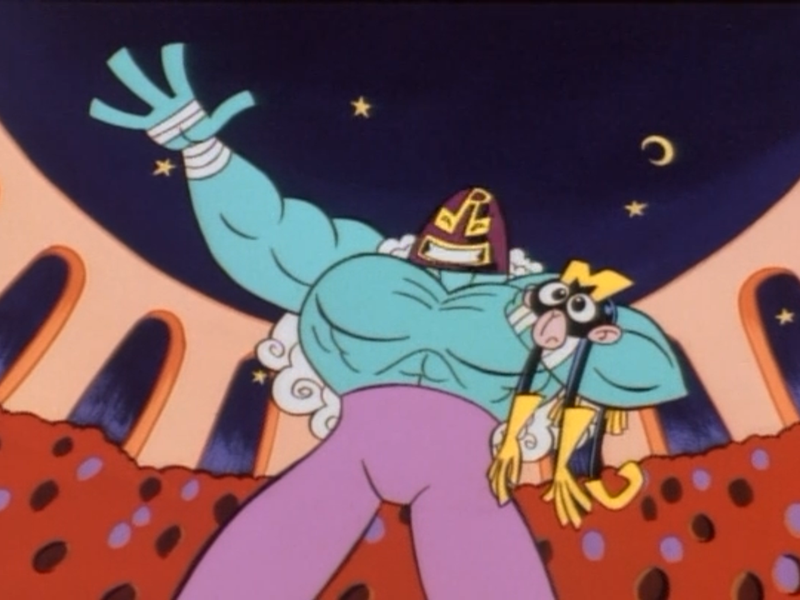 Dexter’s pet monkey, named Monkey, has a short about wrestling in an intergalactic wrestling federation that’s not the Marvel’s Unlimited Class Wrestling Federation. The champion is a Randy Savage-voiced blue alien hulk by the name of Rasslor. He defeats all of Monkey’s Justice Friends allies, and Monkey as well. But it’s Monkey who earns Rasslor’s respect for never giving up. Originally, only there to take in the action from the stands, a case of mistaken identity leads to Rigby, Mordecai, and Pops taking part in a ladder match that involves wrestling characters named Four-Armageddon, Hissy Fit, and The Fire Marshall. 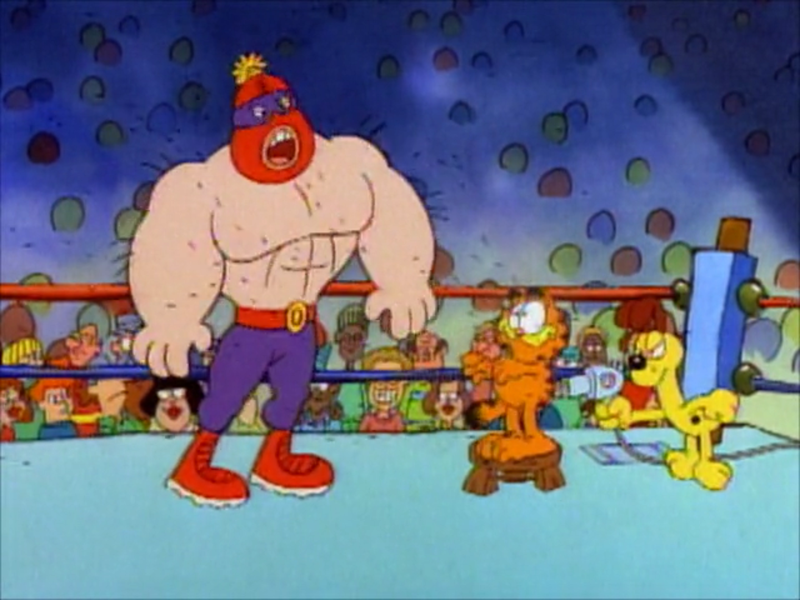 Garfield’s owner, Jon Arbuckle, gets into a real-life altercation with wrestling champion, The Masked Mauler, which leads to Jon having to wrestle him in an actual pro wrestling match. Jon adopts the clever ring name, Turnbuckle Arbuckle, but that’s about as good as it gets for him. Garfield comes to his aid, exploiting Mauler’s allergy to cats, and exposing his true identity in the process. Highlighting the fact that wrestlers never know when to hang up their boots, Grandpa Lou reveals he’s an active competitor in the senior’s division of pro wrestling. In this episode, he’s booked to face his arch nemesis Conan “The Crusher” McNulty for the senior’s championship. 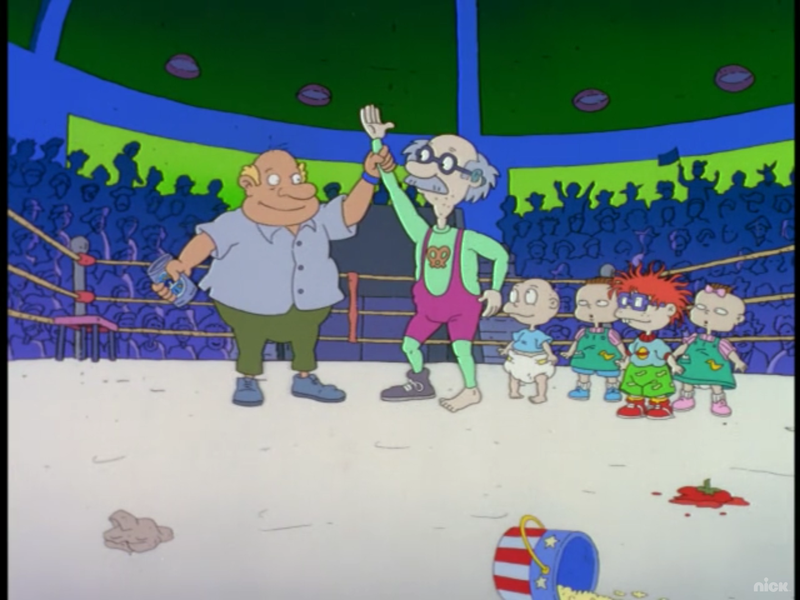 Despite McNulty’s constant cheating, the Rugrats even things out with their own seemingly cute, but really underhanded, tactics. 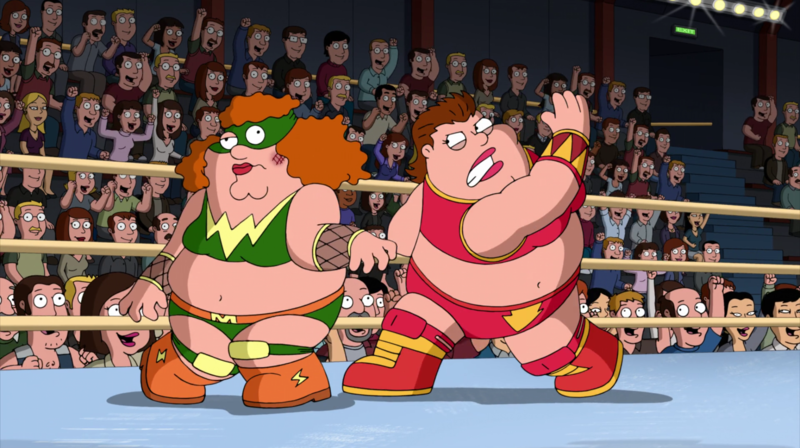 Peter gets tired of his pro wrestler sister’s bullying and decides to confront her about it in the only logical way one can confront a pro wrestler, inside the squared circle. Peter creates an alter ego and he and his sister work out their differences in a Family Guy-style brutal beat down, reminiscent of those Peter vs. Chicken fights. 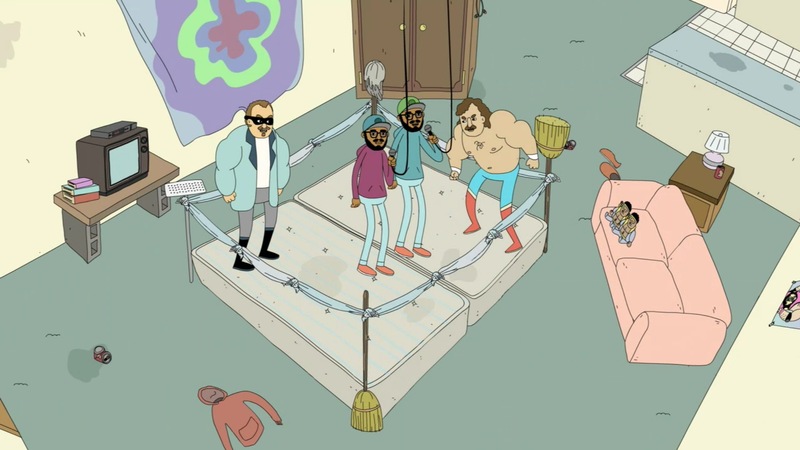 While the only Lucas Bros. Moving Co. episode to feature anything remotely close to an actual wrestling match is this episode that features Jake “The Snake” Roberts vs. The Repossession Man, and later, a stand-off with The Stinger, the rest of the series does a good job displaying the twin brothers’ love of pro wrestling. While Jake cameos as himself here and there, there are other animated wrestlers that pop up throughout the series. The show is also a cool nostalgia trip of 90’s black pop culture. After accidentally taking down the reigning robot wrestling champion, The Masked Unit, Bender is signed on as the newest star of Ultimate Robot Fighting. 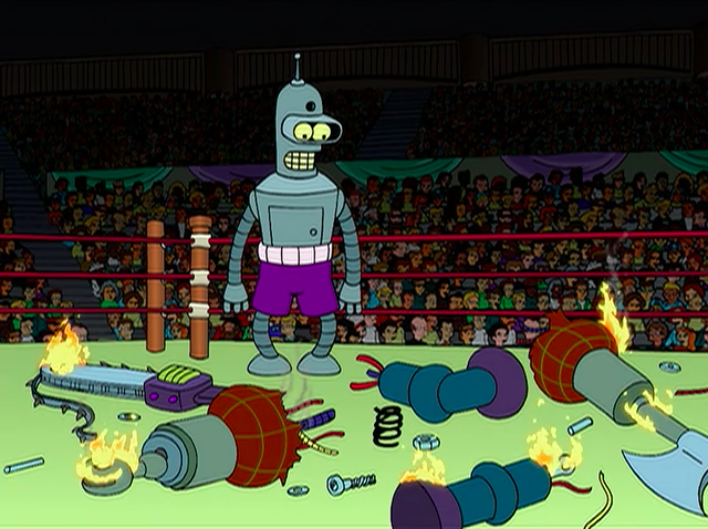 Bender doesn’t mind learning that the matches are fixed so long as he’s winning, until he’s forced to take a dive under a new gimmick once his popularity has died down. He instead tries to go down fighting. It doesn’t work. 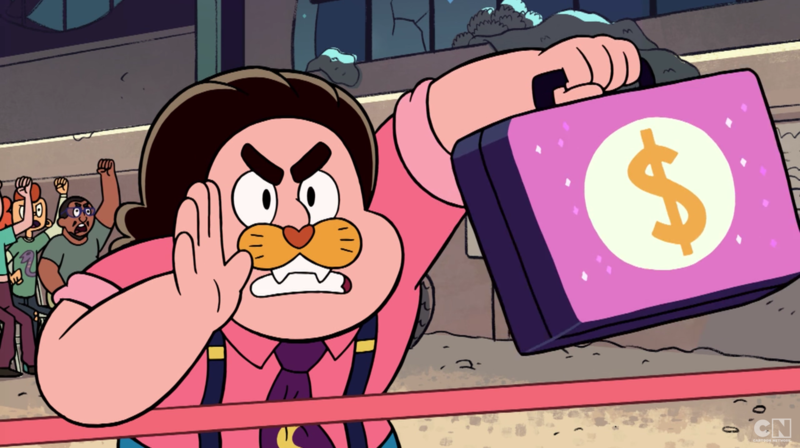 Steven channels his inner wrestling gimmick, which happens to be a mash up of Money Inc., if they were tigers. Along with Amethyst’s alter wrestling ego, Purple Puma, the Jungle Duo take on the entire tag team division of some underground wrestling league, where they rise to the top to become tag team champions and save pro wrestling from the Notorious Order of Wrestling Haters. 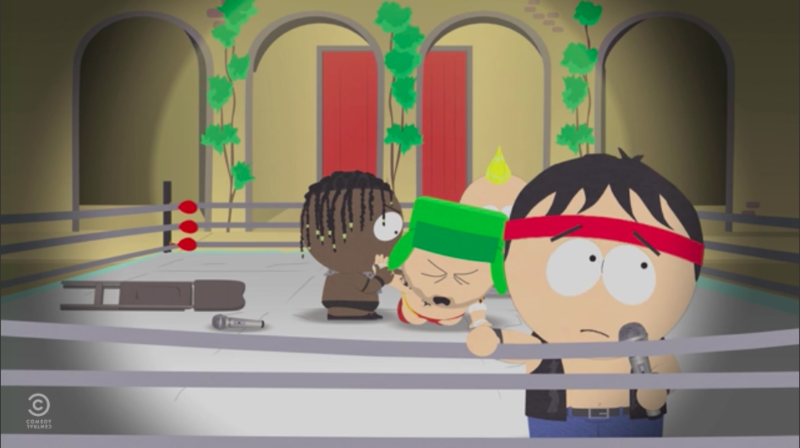 The South Park kids do what all young wrestling fans eventually do, start their own backyard wrestling league. While there is some wrestling involved, the kids find that their strong suit is mimicking the soap opera storylines and promos. The entire episode mocks everything related to pro wrestling, including the fans, and wrestling’s red-headed step child, amateur wrestling.